To help make this Father’s Day extra special, our friends at Rye House and in the beer trade have donated two fantastic experiences for us to give away on our blog. 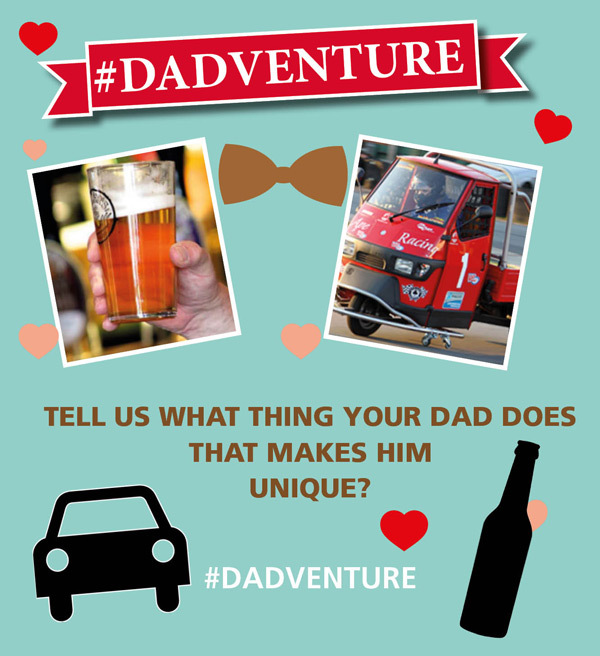 All we ask you to do is to come up with a creative response to our competition question, to be in with a chance of winning a #Dadventure Father’s Day competition prize. To be in with a chance of winning either experience, we’d like to know what special quirk helps make your dad your dad. Does he sing in the shower, dad dance for England or even bring you a cup of tea in the morning? Tell us, what makes him UNIQUE? To enter, please comment below on our blog, by midnight on Thursday 16 June 2016 and indicate which prize (a or b) you are applying for. Winners will be picked at random and announced on Friday 17 June 2016 on the blog post/via other Red Letter Days social media platforms. Confirmations for both prizes will be issued same day. Good luck! Open to residents of the UK and Eire, except for employees of Red Letter Days, their immediate family members or anyone else associated with this giveaway. You must be 18 or over both to enter and to attend either experience if a winner. The prizes are a) RYEPT – Piaggio Ape Racing For Two in Hoddesdon, Herts. or b) XBEER – Brewery Tour and Beer Tasting for Two at a choice of locations. To enter, no purchase is necessary. Entrants are asked to respond to the question using the comments field of the blog or the blog team email address (blogteam@redletterdays.co.uk) by midnight Thursday 16 June 2016. Red Letter Days accepts no responsibility for late entries, delayed entries or non-receipt of entries due to any reason at all, including technical faults or inability to access the internet. The winner/s will be notified via our blog comments field and via email address. Red Letter Days’ decision is final and no correspondence or discussion shall be entered into. Each prize is non-transferable and non-refundable. There is no cash or other alternative to either prize which must be taken as offered. Red Letter Days reserves the right to substitute the prize/s for alternatives of its choosing with a value the same or greater than the original prize/s, in the event of circumstances outside of its control. These terms and conditions shall be governed by English law and the exclusive jurisdiction of the English courts. Red Letter Days reserves the right to cancel or refuse any individual entry or to postpone or cancel the prize/s in exceptional circumstances, including but not limited to circumstances where it is apparent that there has been fraudulent activity or access to the internet has been prevented for a period longer than 48 consecutive hours due to technical problems beyond the control of Red Letter Days. Promoter: Red Letter Days, 100 The Grange, London N14 6BN. All/any expenses incurred (including travel to and from the experience) will be the responsibility of the winner. My dad is the best taxi. He never complains if I want a lift and he sings in the car! My dad is unique because even with 8 grandchildren, he always has time for them all as well as his children. He is generous, kind and loves to host family parties for everyone. #DADVENTURE When my Dad tells a joke even if its not funny we still laugh and he laughs too. He has got a WICKED SENSE OF Humour and it is very infectious. #Dadventure My dad's unique because the older her gets, the more unstoppable he is. He loves music and he goes to festivals with me and last year, just because he'd always wanted to learn to play the guitar, he started taking lessons......at the age of 70. So now he can play 'Sweet Child O' Mine'. And he's pretty good too. He'd love prize b) - the Brewery Tour and Beer Tasting. Prize b please, not unique but my dad was a stay at home dad in the 80's which meant jam sandwiches for lunch everyday! Yay! I'd love to win prize B for him, he loves his beer! My dad must surely be one of the only 73 year olds to have botox but point blank refuse to wear his hearing aids. Makes for constantly surprising conversation though I suppose. Prize B please. My dad unfortunately passed away 5 years ago, but he was unique when he was alive because he always picked me and my friends up from wherever I needed him too and it never mattered what time! My father-in-law to be is like my 2nd dad and is unique in the way that I can talk to him about anything and he is always there when I need him. I would love to take him on a beer tasting experience to say thank you to him. It's the least I can do! prize b please- he loves beer! My Dad play a wicked tune on a 12" ruler using his teeth! He would love B as the prize if he won. Id love this for my partner who is a brilliant father to our little girl. b) XBEER – Brewery Tour and Beer Tasting for Two at a choice of locations. My dad's unique because he has this really funny habit whereby if anyone asks him "How are you?" he always, always, always replies with "Not THREE bad" Groan!!!!! My dad loves his beer so its got to be b) XBEER – Brewery Tour and Beer Tasting for Two. This competition closed at midnight, thank you for all your entries. Two winners have been picked at random, with a coincidental musical theme! Congratulations go to Emma Robson who wins the Piaggio Ape Racing for her trumpet playing dad, and Kevin S whose guitar playing dad will enjoy a beer tasting experience on us. Emails will be issued to both parties today.